When I was at AUT, I was distracted. I enjoyed design, I enjoyed learning… but I was also working 18+ (often 24-30) hours per week, partying most evenings, and was diagnosed with celiac disease. So looking back now, parts of my time at university are a bit of a blur — but there were memorable people, significant aha-moments and favourite classes. The first class I had with Dr Welby Ings was a rainy morning, I remember it vividly. 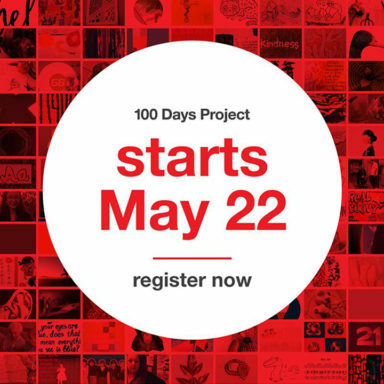 I was sat next to good friend (and founder of ID/labs NZ) Jarrad Caine — It was a core theory class, and Welby was talking to us about the power of persuasion in design. Specifically, the examples he gave were from the heydey of advertising, but I remember thinking how design could affect attitudes, interpretation and manipulate experiences. 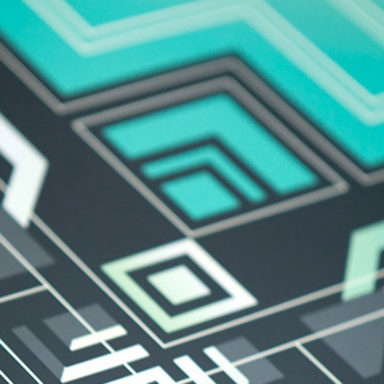 How the author might say one thing on the surface, but the designer could craft the message to read something else entirely, and what a huge responsibility it was to be making meaning through our design treatment. The lesson was memorable, not only because of the content of the class, but because of the way Welby delivered it. He spoke with such enthusiasm, a vigour and excitement I had never seen in a teacher before. I never missed one of Welby’s classes. Each opportunity to learn from him was one I valued. He significantly shaped my understanding of design theory, history and practice. Given that context, it would come as no surprise that I would leap at any chance to collaborate with Welby. 16 years after that first rainy morning class when Welby contacted me to commission the book cover for his new Book ‘Disobedient Teaching’ I was honoured and excited to get the opportunity. Welby contacted me about the project to say he needed the cover to be typographically strong, and it should be something unusual and distinctive. 230mm high x 155mm wide with an 11mm spine printed CMYK and Matt Laminated. With disobedience being a core theme, I had to break the rules in my design response! In my conceptual design phases, I played with text spilling off the page, jostling against other elements and challenging conventions with spacing and orientation. Inspired by Welby’s portrait photo (which needed to feature on the back cover), I wanted to pick up on some teaching iconography, and explored different options for either blackboard backgrounds or chalk lettering throughout the iterations. After a round of feedback from Welby and Otago University Press (the publisher), we settled on the final design. Where the word Disobedient misbehaves my reflecting and deliberately misaligning with the word teaching below. 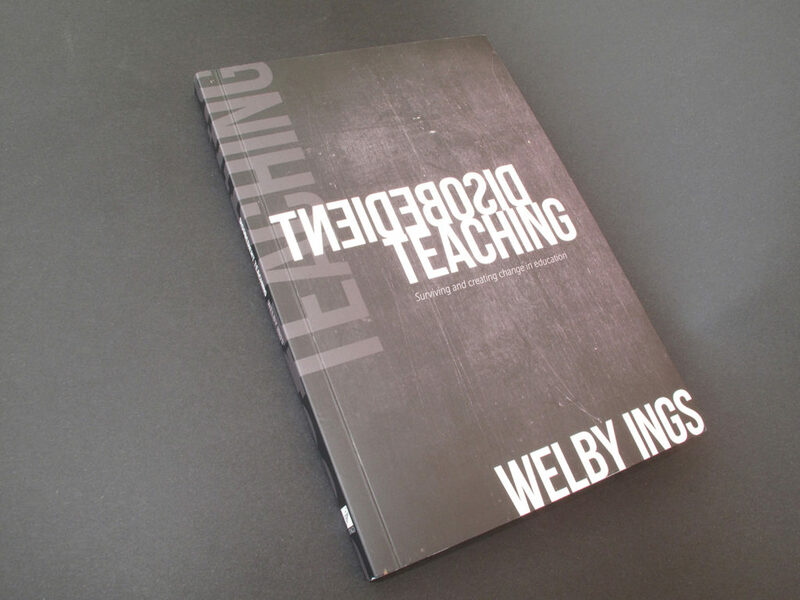 Welby’s name also breaks conventional treatment testing the boundaries of the book format to reflect his location at the edge, as he advances knowledge around teaching practice. The visual language was all intended to capture the ethos of the book and to hopefully support Welby’s innovative thinking. This was a collaborative project. I (Nicole Arnett Phillips) designed the cover, with input from Welby Ings and the Editorial team at OUP. The cover design informs the internal design treatment and typesetting which was executed by Fiona Moffat and Otago University Press. The book, which launched last month, has been hugely successful already. It has been shipped all around the world — and the first print run sold out two weeks after the launch. Subsequently, Disobedient Teaching is already in its third edition! Welby is a brilliant teacher (and thinker! ), he articulates ideas in compelling and memorable ways. 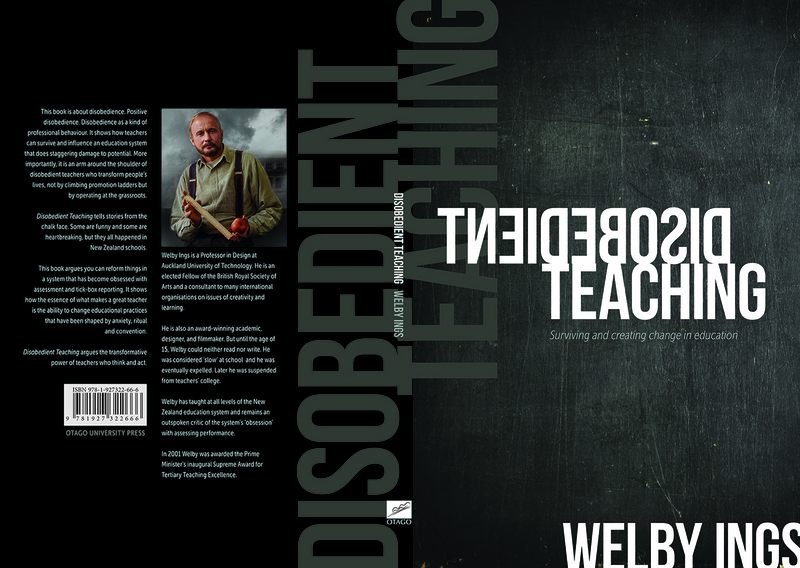 Disobedient Teaching is so incredibly important because it enables Welby’s teaching approach to reach so many more educators and students than can have the privilege of sitting in one of his classrooms. Given the significance it is not in the least surprising the book has 5-star reviews, is being cited by teachers and sporting coaches worldwide, and being shared virally on social media. I am so proud to have been involved in this project, and to have been given the opportunity to use my understanding of design’s potential to add meaning on a book for the inspirational teacher who first introduced me to the connotation and semiotics of visual language.